Scott Jackson, shown last year when Gov. Dannel P. Malloy nominated him as labor commissioner, will be asked to jump-start a stalled Connecticut Retirement Security Authority. 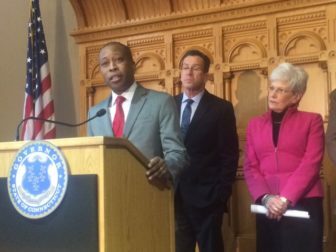 Democrats were quick to denounce President Trump and congressional Republicans for killing regulations set by the Obama administration to ease the way for Connecticut and other states to offer retirement savings plans to low-wage, private-sector workers. But Congress and Trump are not to blame for Connecticut’s making no progress on implementing a state law passed a year ago by Democrats over the opposition of every Republican in the General Assembly. That responsibility rests with a Democrat — Gov. Dannel P. Malloy. The Connecticut Retirement Security Authority created by the state law is months behind schedule, blocked from beginning to work on the payroll savings program by Malloy’s failure to designate a chairman empowered to call the authority’s first meeting. The authority has had enough members for a quorum since January. “We’ve been working on identifying and selecting a chair,” said Kelly Donnelly, the governor’s communication director. In an interview, Donnelly said the governor intends to designate Labor Commissioner Scott Jackson, one of three administration officials automatically on the authority by virtue of their position. Jackson had testified against the bill as originally written, saying it would be a burden for his department to administer. Tom Swan of the Connecticut Citizen Action Group, which joined AARP and labor groups in lobbying for the bill, said he was pleased to hear Malloy was ready to move forward with the authority in the face of opposition by Congress. He said he was not concerned by Jackson’s earlier opposition, noting the bill was revised to meet concerns raised by Malloy. “From what I know of Scott Jackson, he is someone who will make it work,” Swan said. It was unclear when the authority would begin its work. Its first order of business is likely to be assessing the impact of a congressional vote to roll back Obama-era regulations that exempted states and municipalities offering retirement plans to private-sector workers from having to meet all the compliance standards of ERISA, the Employment Retirement Income Security Act. State officials say the rollback of Obama-era rules, first by Trump in an executive order and most recently in a U.S. Senate vote last week, does not bar Connecticut and a half-dozen other states from implementing retirement savings program, but it could complicate the task. “Republicans are standing directly in the way of financially secure futures for hundreds of thousands of Connecticut residents,” said Senate President Pro Tem Martin M. Looney, D-New Haven, a sponsor of the Connecticut law. Under the law, workers with no access to employment-based retirement benefits automatically will have 3 percent of their pay deducted and invested in an IRA. They can set the deductions as high as 6 percent or opt out by setting their contribution as zero. No employer contributions are required. Some representatives of the mutual fund industry opposed the bill, saying it puts government in competition with a private sector happy to open IRAs and sell securities. Sponsors countered that the program targets low-wage workers whose employers offer no payroll savings plan and who are least likely to make retirement investments on their own. According to the U.S. Bureau of Labor Statistics, only 40 percent of private workers with wages in the lowest quarter of earners have access to retirement programs through their employers or unions. Payroll deductions are the single easiest way to encourage savings. Sponsors of the Connecticut law say governments must act to encourage savings in an era when private-sector employers are ceasing to offer pensions. The Bureau of Labor Statistics says fewer than 20 percent of private-sector workers are covered by pension plans. “Establishing an auto-IRA is one of several approaches that states and cities are taking to address inadequate retirement savings, and one of the most ambitious and contentious,” according to a report by the Pew Charitable Trusts. Ultimately, without a boost from the Malloy administration —a tie-breaking vote in the Senate by Lt. Gov. Nancy Wyman — the measure would have died. Democrats had a 21-15 majority last year, but three Democrats voted with all 15 GOP senators against the bill. The Malloy administration, however, insisted on revisions before the governor would sign the bill into law. The original legislation set a deadline of July 31, 2016 for Malloy and the legislature’s top six leaders to each appoint one member to a quasi-public authority that would develop and implement a low-cost Roth IRA payroll savings program. The authority was to have nine members: the seven appointees of the governor and legislative leaders, plus Comptroller Kevin P. Lembo and Treasurer Denise L. Nappier. At the governor’s request, the law was revised in special session last May to expand the authority from nine to 15 members, giving the Malloy administration an additional six seats, plus the power to designate a chair. The six additional members include three to be selected by Malloy and three to serve automatically by virtue of their positions in the executive branch: Jackson, the labor commissioner; Jorge Perez, the banking commissioner; and Ben Barnes, the secretary of policy and management. The deadline for making appointments was extended until Jan. 1, 2017. Senate GOP leader Len Fasano of North Haven voted against the bill, but he was the first to appoint a member. In July, he selected John Sayour, who served on the Connecticut Retirement Security Board that recommended the 2016 legislation. Senate Majority Leader Bob Duff, D-Norwalk, named Ed Zelinsky, a law professor, in August. House Majority Leader Matt Ritter, D-Hartford, named Keisha Palmer, an attorney with an expertise in banking and consumer finance, soon after assuming his new leadership position in January. Looney named Peter Eder, an AARP volunteer, in February. House Minority Leader Themis Klarides, R-Derby, picked Thaddeus Gray, an investment adviser, in early March. Malloy made two of his three selections two weeks later, picking Joseph Fazzino and William Kosturko. Fazzino is a corporate pension investment executive, and Kosturko is an AARP volunteer and former banker who served on the retirement security board and urged passage of the bill. House Speaker Joe Aresimowicz, D-Berlin, an early backer of the legislation, didn’t name his choice, an AARP volunteer and retired financial planner named Thomas Sennett, until April 27. Looney said the appointments took time because the legislation required them to find individuals with specific investment expertise who would represent various interests.